Life cycle: This insect produces two to four generations each year and overwinters as a pupa, or an adult in southern regions. 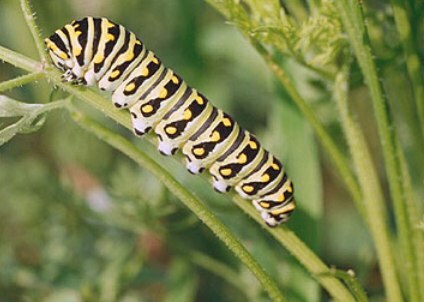 This 2-inch long caterpillar starts brown with white on its back, later turning to green with a yellow dotted black band across each segment. When disturbed, it projects two orange horns and emits a strong, cloyingly sweet odor. The well-known adult butterfly has large black wings with three rows of yellow markings parallel to the wing edges. The rear wing also has a blue row, an orange spot on each, and projecting lobes. The wingspan is 3 inches. The white eggs are laid singly on the leaves of the host plants. Feeding characteristics: This pest attacks carrot, celery, parsley, and parsnip by chewing the leaves and stems. Since the population is rarely large, usually very little damage is done. Controls: Early morning handpicking is usually sufficient to control this pest. However, if this is not adequate, apply Bacillus thuringiensis.